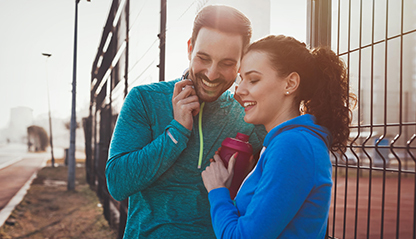 Choose from our premium GNC-brand assortment and get high-quality ingredients that work for you. 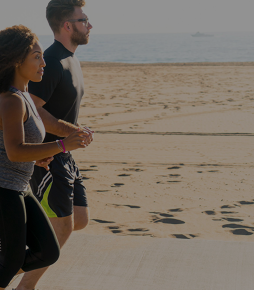 Scientifically formulated and lifestyle-specific means more support every day for every need. We perform up to 150 quality checks to help you live well. Get fitted with the multi of your choice. No matter your age, gender and lifestyle, GNC has the multi you need to crush your goals. GNC Mega Men® contains a clinically-studied multivitamin blend to help support your overall health concerns and fill nutritional gaps in your diet — including men's health, cell protection, immune and heart health. 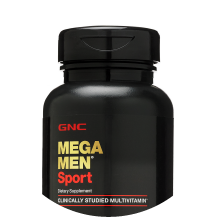 GNC Mega Men® Sport contains a clinically-studied multivitamin blend to support your active lifestyle. It contains a sports blend featuring beta-alanine and a BCAA blend to help fuel muscles, giving you the extra support to keep up with your fitness routine. 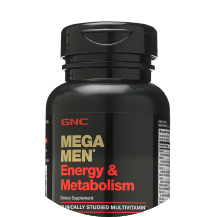 GNC Mega Men® Energy + Metabolism contains a clinically-studied multivitamin blend to help support your busy lifestyle. It features B vitamins, which are essential for energy production, and an Energy + Metabolism Blend featuring caffeine and green tea extract. GNC Mega Men® Energy + Metabolism contains a clinically-studied multivitamin blend to help fill nutritional gaps if you're watching your diet. In addition, it features a combination of thermogenic ingredients that may support calorie burning and mental sharpness. GNC Mega Men® 50+ contains a clinically-studied multivitamin blend to help support the changing health concerns that come with age, including heart health with vitamin B-6 and folic acid, and prostate and circulatory support with lycopene, saw palmetto and L-arginine. 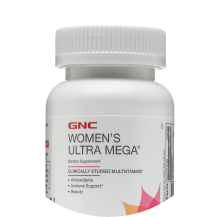 GNC Women's Ultra Mega® contains a clinically-studied multivitamin blend to help support your overall health concerns and fill nutritional gaps in your diet -- including women's health, cell protection, immune and beauty. GNC Women's Ultra Mega® Active contains a clinically-studied multivitamin blend to support your active lifestyle. 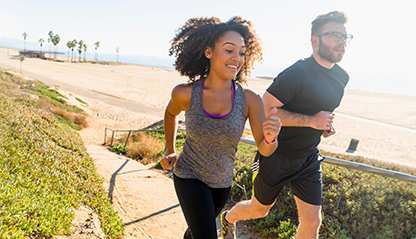 It features ingredients that help fight free radicals which can be produced from your workout and an antioxidant blend for cell protection and oxidative stress defense, to help give you the extra support to keep up with your fitness routine. 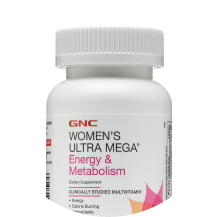 GNC Women's Ultra Mega® Energy + Metabolism contains a clinically-studied multivitamin blend to help support your busy lifestyle. It features B vitamins, which are essential for energy production, and an Energy + Metabolism Blend featuring caffeine and green tea extract. GNC Women's Ultra Mega® Energy + Metabolism contains a clinically-studied multivitamin blend to help fill nutritional gaps if you're watching your diet. In addition, it contains a combination of thermogenic ingredients that may support calorie burning and mental sharpness. 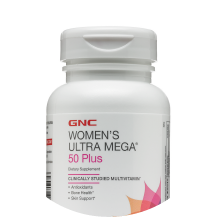 GNC Women's Ultra Mega® 50+ contains a clinically-studied multivitamin blend to help support the changing health concerns that come with age, including bone health with calcium and vitamin D, and skin support with lutein and hyaluronic acid. 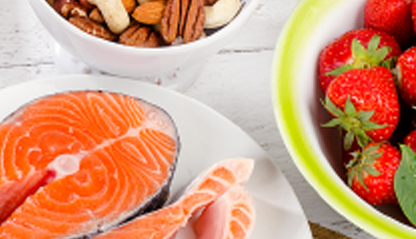 *In a randomized, double-blind, placebo-controlled study of 112 healthy volunteers, subjects taking the GNC vitamin and mineral blends for six weeks experienced significant improvements in serum levels of certain key nutrients compared to a placebo and a basic multivitamin formula based upon multivariate statistical analyses of a group of B vitamins (thiamin, niacin, riboflavin, pantothenic acid, biotin, folic acid and vitamins B-6 and B-12) and key antioxidants and carotenoids (a group of beta-carotene, alpha-tocopherol, selenium, lutein and lycopene). Statistically significant improvements in SF-36 Vitality and Mental Health scores were also observed compared to placebo. ^Offer valid online and at participating stores July 26 through July 28, 2018. Does not combine with any other promotion. Excludes discontinued products. Select products only. See an associate for details or click on "Shop Now" to view specific products included in the sale.